Easter was very special the year. We got the families together this year to celebrate Easter and also Luke's 2nd Birthday. She did it with balloons, embroidery thread and glue. So cute. 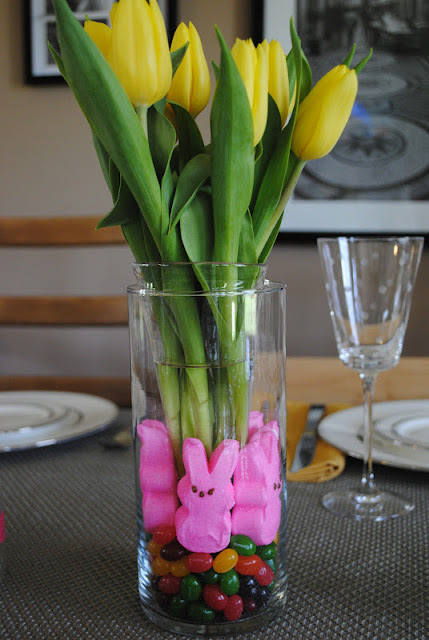 What a great way to use peeps. She had this made by "That's Just Delish". Adorable isn't it. And than my personal favorite. Raspberry and peach trifle. Thank you for making this Cait. It was sooooo good. "Please note daddy has to hold my hands down or I would so be grabbing this cake." everything looks great!! good for you! We can so make this trifle when you come up next time. It will be a great way to celebrate you being here. ha ha! Funny that his poor little hands had to be held down. :) How fun to use peeps in the vase! I love those floss "eggs". Totally clever. CUTE photos! LOVE that cake, you know we did Easter and a birthday on the same day too! Love those string egg accents.